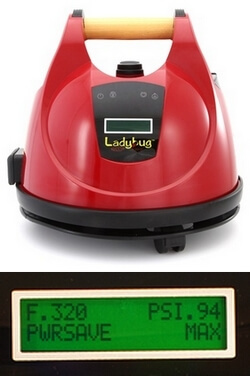 Ladybug vapor steam cleaners are widely recognized as steam cleaning dynamos. In this article we review the Ladybug Tekno 2350. Ladybug vapor cleaners are among the highest rated steam vapor cleaners in the industry. We have previously looked at the Ladybug XL 2300, 2300 XLT, 2150 and the 2200 S. Therefore, in this article we shall have a close look and review the Ladybug Tekno 2350. This vapor cleaner is one of the newest offerings from Ladybug. It is not only new, but a top of the line piece of machinery that will exceed all of your expectations. If you’re serious about having a clean and spotless home, no matter the cost, then read on. 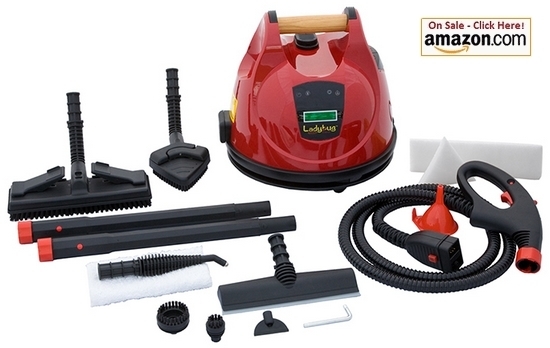 This is a beautifully designed steamer that has a wide range of premium attachments and tools. It also comes with TANCS: nanotechnology that creates a disinfectant from ordinary water. This model is also equipped with an LCD display to show information on temperature, pressure and other readings. This machine’s boiler can easily reach up to 324 degrees and its pressure is set to 90 psi. The water reservoir is not pressurized which gives rise to its continuous fill capability. You never have to stop steam cleaning in order to fill up your Ladybug. When the water reserves start to run low, the machine emits a beep to let you know it needs to be topped up. One interesting ability this machine has is that it can clean for up to 3-4 hours every day. This makes it perfect for use in a wide variety of business places such as a pet store, vet clinic, daycare, hospital, office and of course at your home. It is easy to control and customize the settings with the controls and pressure gauge which makes regulating your steam very simple. With each purchase of the Ladybug Tekno, you get standard accessories which include: extension handles, triangle and floor brushes, nozzles, scrapers, drain tool, filler pads, assorted brushes and an instruction dvd and manual. In addition to the ordinary accessories you also get some additional kit which includes a trolley cart to store and move your steamer around. Ladybug vapor steam cleaners are highly recommended because they are EPA certified and are certified that they can clean at sterilization levels with regular usage. Some common uses for this steamer include: in business offices, cleaning around the home, great for detailing boats and vehicles and just about anywhere you can think of. • Amazing and wonderful steamer- Does exactly what you need it do and more. • It is easy to use, effective and very reliable. • The TANCS functionality is great for disinfecting areas and getting rid of mold, mildew, microorganisms and other offending bacteria. • The caster wheels are sturdy which makes maneuvering this machine very easy around the home. • This is not a cheap buy but it is worth the money. • It can be noisy.